Brozra Web Solutions LLC's roots comes directly from the owner of the company, Russ Alexander II, who has been working on web development since the mid-90's. Times were different then and HTML 1.0 was all the rage. Some of the first web sites he developed include KSWO (www.kswo.com) and KCCU (www.kccu.org) in 1995. Of course these websites have changed dramatically since those days! At the time, he was studying Computer Science and Mathematics at Cameron University in Lawton, Oklahoma. He learned how to do web development on his own and it became more like a hobby at the time. After college and 6 years of working in the IT industry as a website developer, webmaster, computer technician, network administrator, systems administrator, field engineer, network engineer, and other IT-related positions, Russ ventured out on his own and began a company to provide in-home / in-office computer support in Dallas, Texas. Over this time he built websites for friends, family, and business associates, but never treated it like a business. Even while he was serving a four-year tour on active duty as a medic(68W) in the United States Army, Russ built a website (Reynolds Army Community Hospital Pediatric Clinic - 2004) just to keep up with technology and to help those out who needed good websites. After leaving the Army, Russ decided once again to satisfy his entrepreneurial hunger and open another business. At first, Brozra.com was just a simple e-commerce site selling retail merchandise, but it grew over time into what you see today. 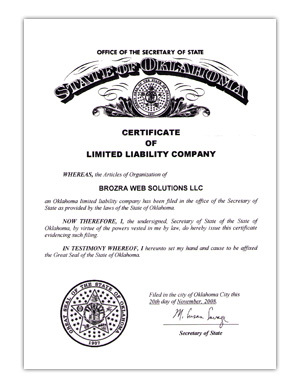 Brozra Web Solutions LLC was officially registered with the state of Oklahoma on November 20, 2008 and we hope that it continues for years to come! Brozra Web Solutions LLC will optimize its value by focusing on efficiently utilizing all available resources for profitable growth in its core business of website-affiliated services. Brozra Web Solutions LLC will aggressively pursue knowledge and certifications in web development-related disciplines in order to provide better quality products and services to its customers. Brozra Web Solutions LLC will always listen to our customers, both internal and external, for their valued input on the development and growth of our company. Brozra Web Solutions LLC will keep its finger on the pulse of new software technologies to provide the latest advancements to its customers. This Company is a customer-oriented service solutions provider. Our dedication to technology, service, and quality are more than just words. They reflect a commitment that surpasses all others. Services we offer include website design, graphics design, website hosting, and logo branding. Brozra Web Solutions LLC is veteran and minority owned. Quality is an integral part of every service that we provide. Our staff remains committed to product knowledge and expertise, and our management team strives to provide both our staff and our customers the highest level of quality and professionalism. Combined, this "Team effort" ensures that customers can count on receiving services and workmanship of the highest quality. This Company believes that customer satisfaction plays a vital role in establishing a successful business. Our staff will do everything they can to ensure that its customers receive the best possible quality of service. Our staff is comprised of skilled product specialists and customer service personnel that will support our customers needs when they arise. Our record of customer service excellence is confirmed each day in the trust, confidence and loyalty we have earned from our customers.